Alongside Doña Marina (Malinche), the loyal interpreter and mistress of Hernando Cortés, Doña Isabel de Moctezuma, the daughter of the famous Mexica huey tlahtoani (supreme ruler) Motecuhzoma Xocoyotzin is the most well-known and popular female personage of the late pre-Hispanic and early colonial history of Mexico. Both Mexican historiography and art usually portray her as the favourite daughter of the hapless ruler: beautiful, kind, generous, brave, true protector of the vanquished Indians, in brief a complete antipode to treacherous Malinche. It’s generally assumed as well that she was born around 1510, that her true name was Tecuichpo or Tecuichpochtzin (commonly translated as “cotton flower”), and that she married and truly loved the last Mexica huey tlahtoani Cuauhtémoc, venerated in Mexico as a national hero for his heroic and desperate defense of besieged Tenochtitlan in 1521. However, most of these facts belong in the realm of legend and imagination, and have little confirmation in historical records. The latter, although relatively numerous, contain too scarce and contradictory data to reconstruct the personality of Motecuhzoma’s daughter, or even to write her biography without assumptions, hypotheses and suggestions. At the same time some of them do permit us to glimpse the life of the “last Mexica princess” and her world, and the full picture differs significantly from the popular vision, nurtured by the works of fiction and the biased interpretations of several passages of the most frequently used historical accounts. Alfredo Chavero, one of the influential Mexican historians of the late 19th century, stated that Doña Isabel was born in July 1510 (Chavero A 1953:1:857). This date was uncritically accepted by future generations of scholars and passed even in the Wikipedia article about Motecuhzoma’s daughter. Had it been true, by the time the Spanish arrived our “princess” would have been a girl of only nine years old. Actually Cortés himself in his donation grant of June 1526 refers to his “foster-daughter” as being of marriageable age by that year (Martínez J. L 1990:1:380). At the same time Chavero didn’t support his conclusion with any documentary evidence, and even today we have yet to find any document in which Doña Isabel’s date of birth has been indicated. In a conversation with the 16th century Spanish historian Gonzalo Oviedo y Valdés, her last husband Juan Cano told him that at the time of Motecuhzoma’s death on June 30th 1520, Doña Isabel and her only brother Axayacatl were “both kids” (muchachos ambos) (Oviedo 1995:120). However, Juan Cano’s testimony is strongly biased, keen to explain to Oviedo why none of Motecuhzoma’s children had succeeded him, if they really were his only “legitimate” heirs. It should be stressed, however, that in Tenochtitlan the xiuhuitzolli (the turquoise diadem of the supreme ruler) usually passed not to his children but to his younger brothers or nephews, although very probably under one notable condition, which we’ll discuss below. At the same time we have the very curious testimony of the conquistador Juan de Nazera, one of few eye-witnesses of Conquest, who was still alive by the end of the 16th century. 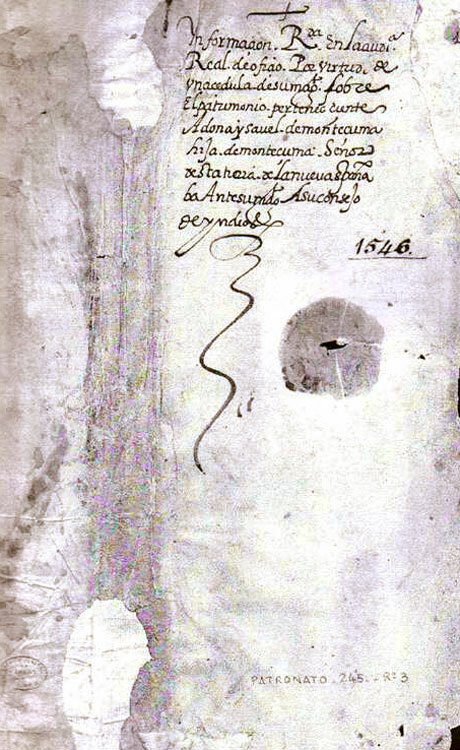 It’s contained in the “Information of Don Gonzalo Cano de Moctezuma”, another record of the lawsuit initiated by Gonzalo Cano de Moctezuma, the younger son of Doña Isabel. On December 15th 1581, being a very old man of 86, he stated that: He knows and he saw that after the Marqués del Valle [title of Hernán Cortés] and the other conquistadors had come to this city the said Monteçuma gave and presented to the said Marqués del Valle three maidens saying through interpreters... that these maidens were his daughters and he was giving and presented them as a sign of peace and friendship and this witness saw that one of them was Doña Isabel (AGI Patronato Real 245, R.7, f.7r). In late 16th century Castillian the word moças (pl. form from moça “maiden”) used in the original of this document was still applied to adolescent or young unmarried females, not to little girls (Corominas y Pascual 1954:463). We should take into account as well, that in those days there was no firm demarcation line between teenage girl and young woman, as it exists now. In late medieval Spain the minimum marriageable age for women was 12 years. 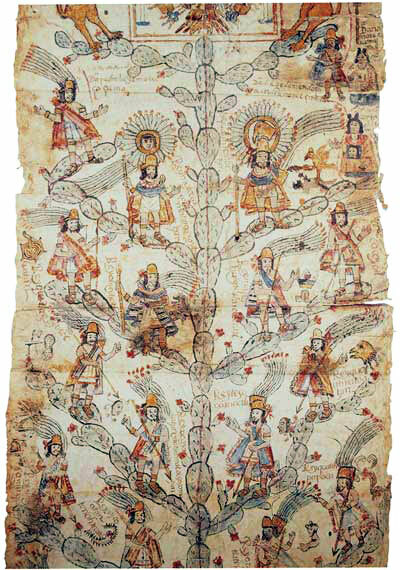 We find strong - albeit indirect - evidence that Doña Isabel might have been born much earlier than 1510 in the “Information of Doña Isabel de Moctezuma”, which contains the testimonies of former servants of Motecuhzoma Xocoyotzin and of his predecessor Ahuitzotl. At the start of the litigation process, one of the oldest witnesses, Don Miguel Tulnahuacatl, stated that Doña Isabel was born during the reign of Ahuitzotl, when his nephew Motecuhzoma was still one of the military leaders in his service (AGI, Patronato Real 181 R.8:f. 119v). According to all accounts Ahuitzotl died in 1502, and Motecuhzoma succeeded him the same year or one year later in 1503. 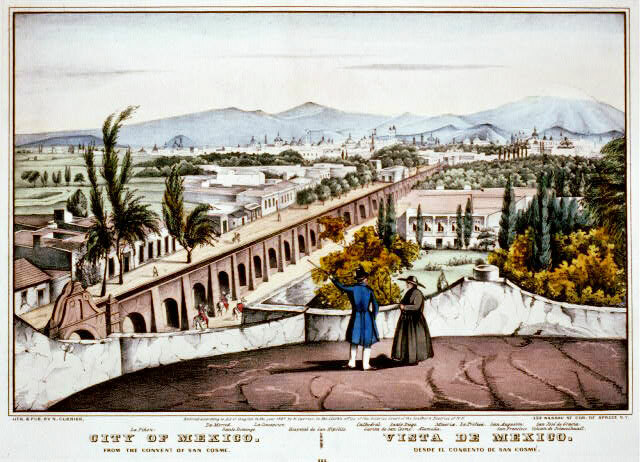 Thus, if the memory of the old man didn’t fail, by the time of the Spanish invasion Doña Isabel must have been at least 17 years old, i. e. pretty much adult by both Mexica and Spanish standards. Historical records again present serious discrepancies about the identity of Doña Isabel’s mother. The pre-Hispanic Mexica elite, in particularly huey tlahtoque practiced polygamy, and the Spanish historian Francisco López de Gómara attributed to Motecuhzoma no less than... 3000 wives and concubines (López de Gomara 1852: 318). According to mestizo historian Fernando Alva Ixtlilxochitl Doña Isabel’s mother was the chief wife of the ruler. Ixtlilxochitl affirms that her name was Tayhualcan, and she was the daughter of Totoquihuaztli, the last pre-Hispanic ruler of Tlacopan, the city-state, which together with Tenochtitlan and Texcoco formed the powerful Triple Alliance, i.e. the confederation which we usually call the “Aztec empire” (Ixtlilxochitl 1848:277). This sounds plausible, for the Mexica rulers actually chose some of their wives among the daughters of their closest partners, the rulers of Texcoco and Tlacopan, who in turn married the women from the Mexica ruling lineage. At the same time Mexica rulers more than others practiced marriages within their own lineage, especially among first cousins and even between uncles and nieces. 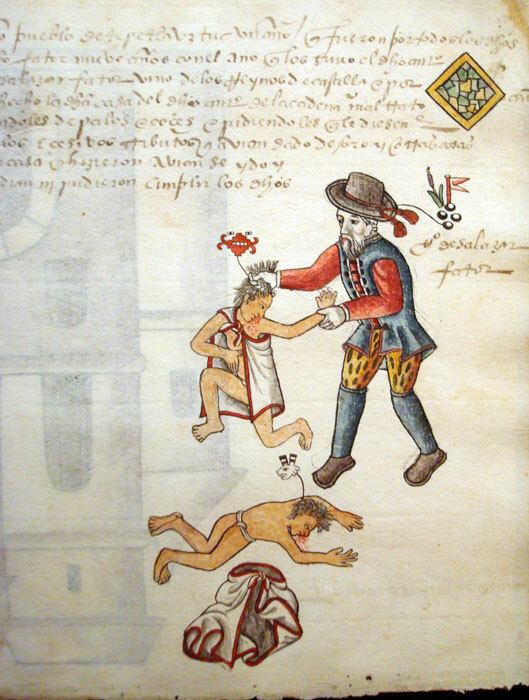 It seems that this practice was based on the common pre-Hispanic belief that a child possessed “the colour, the blood, the essence” of both parents (Florentine Codex 1950-82:6:126). In this context Mexica noble women, especially daughters and sisters of rulers, often acted as transmitters of power from their fathers to their husbands. Another factor which should be taken into account is the evident belief of the last pre-Hispanic Mexica lords in their divine or at least semi-divine origin. 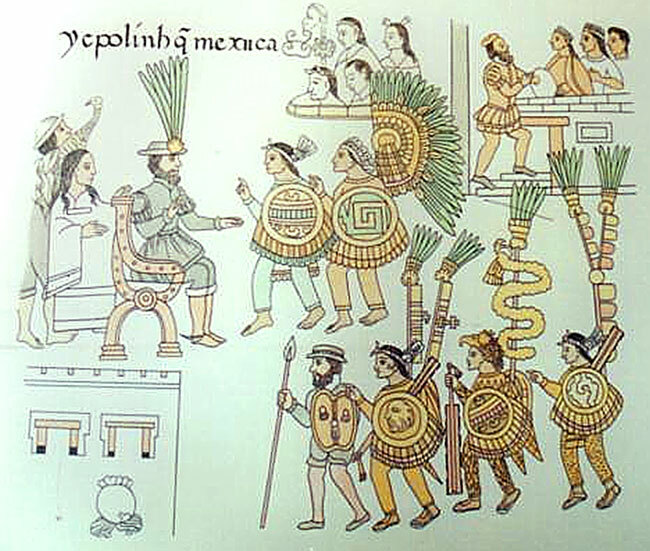 From the middle of the 15th century the Mexica rulers tried to prove their blood relations with the last Toltec kings, and even with the god Quetzalcóatl, who according to widespread myth ruled the Toltecs under the name of Ce Acatl Topiltzin. 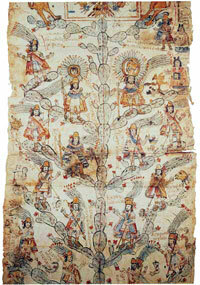 Probably in the same period Mexica rulers made another claim to divine origin, and created a new myth about the miraculous conception and birth of the ruler Motecuhzoma Ilhuicamina (Moctezuma I), great-grandfather of Motecuhzoma Xocoyotzin, from the precious stone introduced into the virgin womb by the supernatural power of the god Tezcatlipoca (Alvarado Tezozomoc 1975:95). In this context even more plausible looks the statement that Doña Isabel’s mother was the daughter of Ahuitzotl, and therefore Motecuhzoma’s first cousin. This statement we find again in the “Information of Doña Isabel de Moctezuma”, confirmed by all the 29 indigenous witnesses listed, and in the “Crónica Mexicayotl” by Alvarado Tezozomoc. 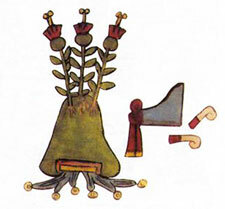 Two of the witnesses could remember that Motecuhzoma married Ahuitztotl’s daughter, whose name is transcribed as Tecalco, around 1500 - that is, immediately before ascending the throne. Taking into account the cognatic nature of Mexica kinship and earlier precedents in Mexica dynastic history, it’s highly probable that marriage with the daughter of a previous ruler was the necessary condition to succeed him. Quite logically the children of such marriage were considered as being endowed with a double portion of royal and even divine blood. Thus, like her mother Doña Isabel might have been regarded as the transmitter of rulership to her husband and children. It’s curious that at the same time no woman occupied the throne of Tenochtitlan, with the possible exception of Atotoztli, the daughter of Motecuhzoma Ilhuicamina, who might have been regent, till her son Axayacatl came of age (García Icazbalceta 1941:3:279). However rule by women was considered as a clear anomaly by the warlike Mexica, to whom their ruler was first of all the commander-in-chief, and warfare was exclusively a male affair. Another very possible indicator of Doña Isabel’s position as transmitter of rulership is her commonly accepted name or rather honorific title Tecuichpochtzin. Due to the polysynthetic nature of the Classical Náhuatl (Aztec) language, in which prefixes, nouns, verbs, and suffixes literally glue to one another forming long and often almost unpronounceable constructs (for Europeans), there are at least two possible translations. As we noted before the first one, more common but not necessarily correct, is “ little cotton flower” or more correctly “little lordly flax of the silk-cotton tree” (derived from tecuhtli or teuctli — “lord”, ichcatl — “cotton” or “cotton flax”; pochotl — “silk-wood tree” and compounding element tzin, which, depending on context, can have either a diminutive or honorific meaning). The second variant is “venerable lord’s daughter” (from tecuhtli and ichpochtli—girl, and with possessive prefix, one’s daughter). Although ichpochtli has the second meaning only with possessive prefixes, it should be noted that in the present case the possessive prefix i (his, hers, their) must be completely absorbed by the first vowel of the following word. If we assume the latter translation we have a precise description of Doña Isabel’s position in respect to her father, and it sounds more like an honorific title, suggesting a very special status for its owner in the Mexica ruling household. 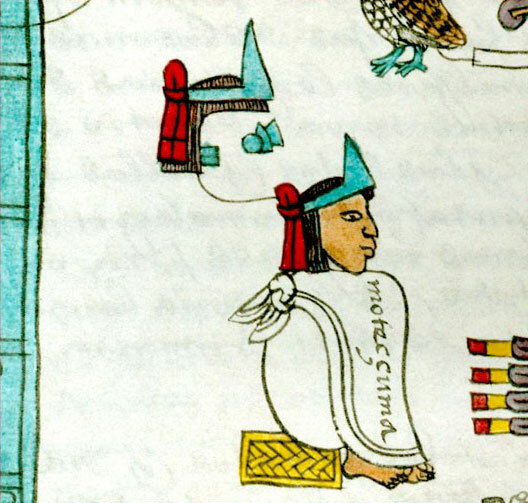 Noteworthy in the first folio of the colonial Codex Cozcatzin Doña Isabel is depicted with a turquoise diadem name glyph, which is actually read as tecuhtli - “lord” (Picture 7 - Codex Cozcatzin f.1v Motecuhzoma Xocoyoztin, Doña Isabel and Don Pedro Tlacahuepantli). This glyph is also included in the name of her father, as Motecuhzoma literally means “he who gets angry as a lord”. 3) Doña Leonor de Moctezuma and Doña Maria de Moctezuma, both born from the daughter of Motecuhzoma’s cousin and chief counselor Tlilpotonqui (Alvarado Tezozomoc 1975: 150-152, 154-156, García Icaz-baceta 1941:280; Pérez Rocha E, Tena R. 2000: 102). Doña Maria evidently died young and unmarried, but Doña Leonor married twice, having receiving in dowry from Hernando Cortés the town of Ecatepec in the present state of Mexico. Both of her spouses were Spanish conquistadors, first Juan de la Paez, and later Cristobal de Valderama. In the latter marriage she had only one child also baptized Leonor. Leonor Valderrama de Moctezuma also married the Spaniard Diego Arias de Sotelo, and this couple gave origin to the lineage of Sotelo Moctezuma, whose descendants still live in Mexico. Finally, the youngest half-sister of Doña Isabel, baptized later as Doña Francisca, was born in the last years before the Conquest if not in the very year of the Spanish arrival. 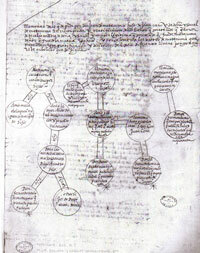 The Relation Concerning the Genealogy and Lineage of the Lords, who have governed this Land of New Spain, written in 1532, still refers to the latter as the youngest of Motecuhzoma’s daughters (García Icazbaceta 1941: 280). Doña Francisca was reared in the house of Doña Isabel and afterwards she married her first cousin Don Diego de Alvarado Huanitzin, the puppet governor of colonial Tenochtitlan in 1538-1541. They had several children, among them the famous native historian Hernando Alvarado Tezozomoc. Notably this was the only couple not to make any claims to the heritage of Mexica rulers. If Doña Isabel was really the favourite daughter of Motecuhzoma, she would have precious few opportunities to feel his love. Mexica valued self-control and reserve as the main virtues in any person. Moreover, the Mexica rulers were considered sacred beings, and access to them was limited by numerous taboos, the violation of which was punished with death even for their closest relatives. Thus, the daughters of Motecuhzoma had few occasions to see him in person, unless he expressly requested it. In this case the meeting might have been arranged as a formal audience. The girls were summoned by their matrons and led together to their father. There they gave due reverence to him and their matron presented their modest gifts: garden flowers, weavings, and embroideries (García Icabalceta 1891:3:110). In turn the father would address his daughters with a long sermon. He warned his daughters against the dangers of this insecure world, and urged them to remain chaste, to be obedient, to practice self-sacrifice and penitence, thus pleasing the gods, and to learn with diligence how to perform their domestic tasks (Florentine Codex 1950-82:6:95-96). This speech was to be heard in complete silence, and accepted with profound gratitude and reverence. Then the daughters were allowed to return to their rooms without receiving any further show of affection from their father. According to the “Information of Doña Isabel de Moctezuma” before the Conquest Doña Isabel married Atlilxcatzin, the son of the ruler Ahuitzotl, who was both her cousin and maternal uncle (AGI, Real Patronato 181:ff. 71v, 72v). He was the first of six husbands, whom Doña Isabel was destined to wed during her life due to the unpredictable course of history. 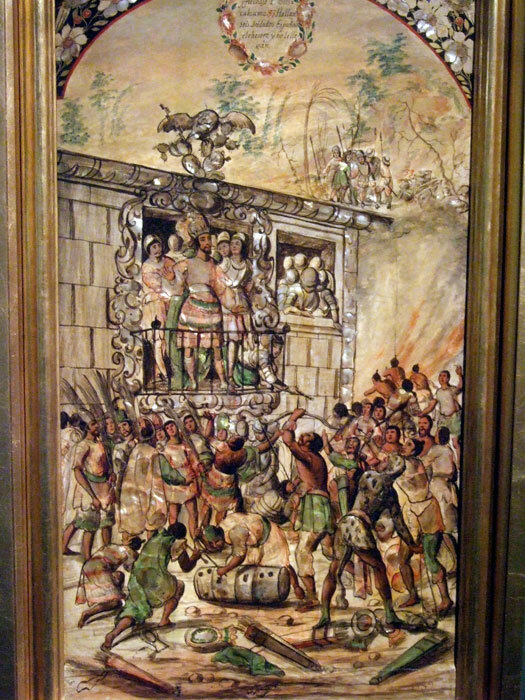 When Cortés and his men, accompanied by indigenous allies from Tlaxcala and Huexotzinco entered Tenochtitlan in November 1519, Motecuhzoma gave his “favourite” daughter with two of her half-sisters to Cortés, possibly as hostages or concubines, or both. No doubt, by this gesture he wanted to confirm his peaceful intentions, because the giving of a ruler’s daughters as spouses or concubines was common Mesoamerican practice in order to establish an alliance with newcomers. Doña Isabel apparently shared her father’s captivity up to his end. In the same donation grant of June 1526 Cortés states that the dying Motecuhzoma called him several times, and beseeched him “very eagerly” to take care of his three daughters, especially of Doña Isabel as his “main and legitimate heir” (Martínez J. L, 1990:1:378). According to this document the two others were Doña Maria and Doña Leonor, born of Motecuhzoma’s union with the daughter of Cihuacoatl Tlilpotonqui. No other eyewitness mentions such a request, and we can’t state for sure whether it really took place. At any rate, at that time the main concern for Cortés was escape from Tenochtitlan, rather than fulfillment of Motecuhzoma’s last will. 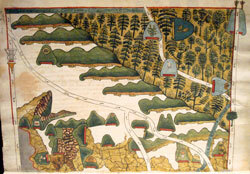 The retreat was attempted immediately upon the death of Motecuhzoma on the rainy night between June 30 and July 1, 1520. Cortés took with him all the children of the deceased ruler as hostages, and many of them lost their lives, when the conquistadors were caught in the act by the Mexica. The Mexica attack was so violent and the Spanish defeat so overwhelming, that this night came to be known as the Sad Night (Noche Triste). So it was for the conquistadors and their allies; for Doña Isabel it was probably the “night of liberation”, for some sources like “The Dialogue between the Alcalde of the Fortress of this City and Port of Santo Domingo of the Island of Hispaniola and Juan Cano” and “Hispania Vitrix” by Francisco López de Gómara, Cortés’s secretary and biographer, mention her presence in Tenochtitlan after the Spanish retreat and her next marriage with her other uncle, the tlahtoani Cuitlahuac, who succeeded Motecuhzoma . After the death of tlahtoani Cuitlahuac Doña Isabel probably had to marry his cousin Cuauhtemoc, the younger son of huey tlahtoani Ahuitzotl, and therefore, Doña Isabel’s uncle. 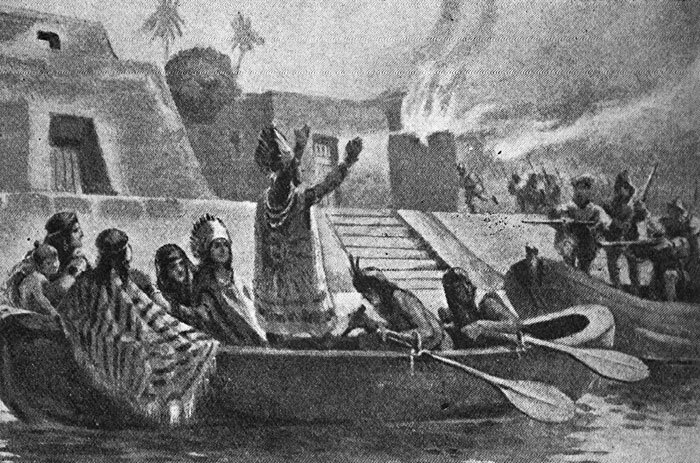 Some sources state that Cuauhtemoc ordered the murder of Axayacatl, the only brother of Doña Isabel. 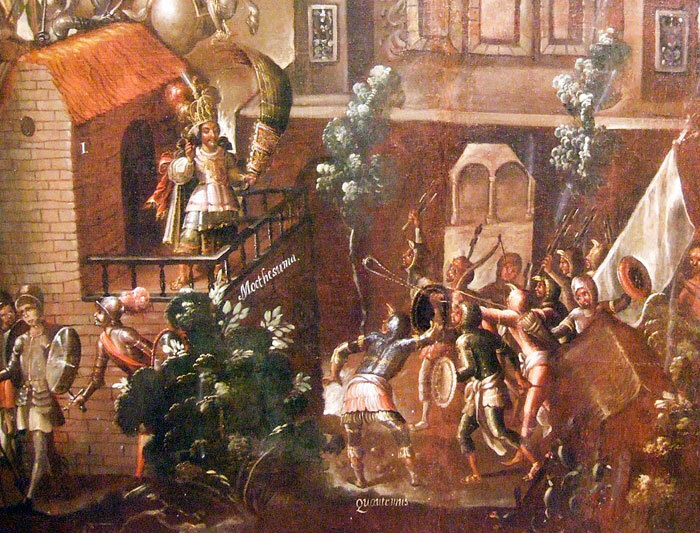 The late sixteenth century Codex Aubin goes so far as to state that Cuauhtemoc personally murdered Axayacatl during their meeting (Codex Aubin, 1980:72). If true, Cuauhtemoc’s motivation for this act might have been not so much his desire to get rid of the more legitimate heir, as Juan Cano insisted, but rather to cease any further division within the Mexica ruling lineage in the face of the Spanish invasion. According to the anonymous account, known as “Origin of the Mexicans” (1532), and to the “Information of Doña Isabel”, Axayacatl tried to follow the collaboration policy of his father, and was killed on his way to the Cortés headquarters in the province of Tepeyacac near the Tlaxcallan frontier (García Icazbalceta, 1941:3:304; AGI, Patronato Real 181, R8: f.72r). In 1521 Cortés made his second attempt to conquer the Mexica, this time by force alone. Due to the coalition made between the conquistadors, the Tlaxcalans (traditional enemies of the Mexica), and former Mexica tributaries and allies like the Texcocans, this attempt was much more successful. 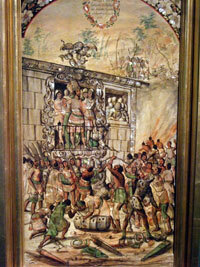 On August 13, 1521 Cuauhtémoc with his young wife and retinue tried to flee from the dying city. They were almost immediately caught by one of Spanish brigantines, which was patrolling the waters of Lake Texcoco. 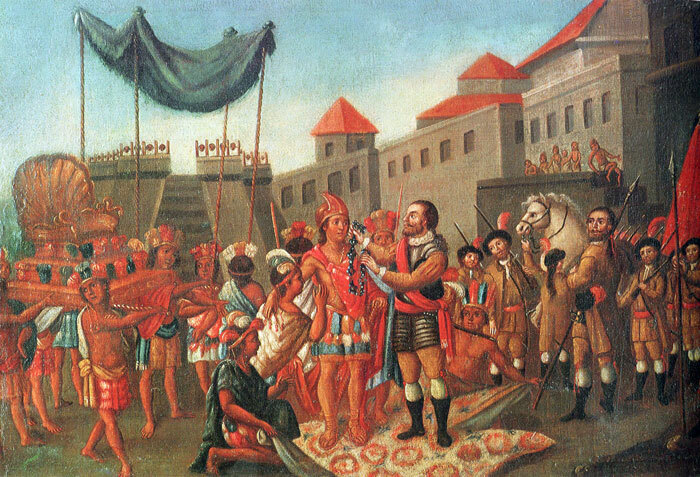 Cuauhtémoc, and some hours later his wife were brought to the Cortés headquarters in the town of Coyoacan, today the southern district of Mexico City. This was the end of their marriage, although we don’t know whether they were immediately separated or allowed to live together. In spite of his initial promise to treat the captive ruler with respect, very soon Cortés ordered him to be put in irons. 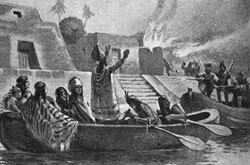 A few months later, when no traces of Motecuhzoma’s gold were found, Cuauhtémoc, who was supposed to know the location of the treasure, was given a barbarous torture by fire with Cortés’s agreement. In 1524 Cortés took the captive ruler on his ill-fated expedition to Hubieras (present day Honduras). There in the middle of tropical rainforest Cuauhtémoc was accused of leading a conspiracy against the conquistador, and hanged. However, in respect of Motecuhzoma’s surviving children and in particular of his “favourite” daughter, Cortés decided to play the role of generous protector, which allowed him to put them under his control once again, and at the same time guaranteed their loyalty to Spanish dominion. 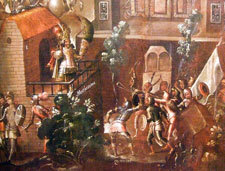 According to the same donation grant of 1526, after the fall of Tenochtitlan Doña Isabel and two of her half-sisters were lodged in Cortés’s house in Coyoacan. The conquistador claimed that he “commanded to have them shown and taught the rules of Our Holy Faith” (Martínez J. L, ed. 1990:1:379). It’s probable that at this time she was finally baptized and received her Christian name, although it might have occurred even earlier in 1519, when Motecuhzoma handed his daughters to Cortés. It seems as well that this pious instruction bore fruit, for later Franciscan monks and the last husband of Doña Isabel admired her devotion and piety. 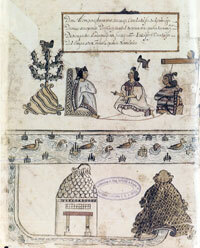 Nevertheless, Cortes didn’t consider it necessary to teach the Mexica “princesses” to read and write. Dona Isabel remained illiterate for the rest of her life, and couldn’t even sign her own will in 1550. In June 1526, Cortés arranged the first Christian marriage of Doña Isabel to his comrade-in-arms Alonso de Grado. It was at that time that he issued the aforementioned donation grant, providing her with a formidable dowry and describing her father’s important services to the Spanish king. 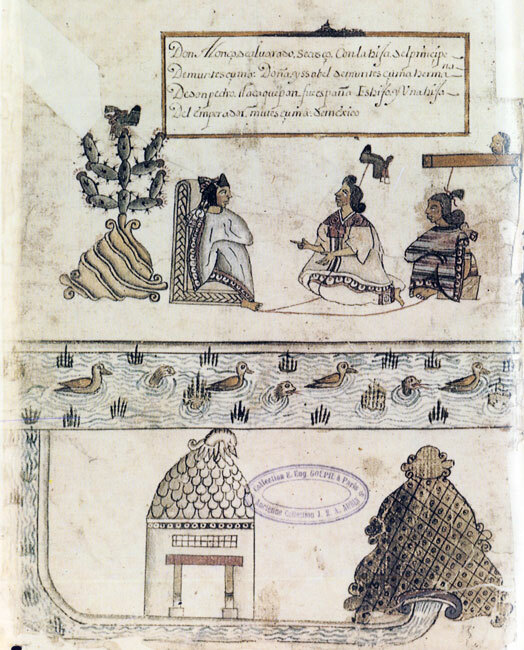 In total Cortés gave in dowry for his foster-daughter “one thousand two hundred and twenty houses” in Tlacopan and its dependent towns, villages and communities (Martínez J. L, ed. 1990:1:380). In Tlacopan Doña Isabel in fact only received 120 houses, but, as is clear from her will, she always considered the entire city of Tlacopan as her own. The groom also received the highly profitable and honorific office of visitador general de indios, that is of commission judge, entrusted to settle conflicts among the native population. However, he didn’t have much time to enjoy his new position and wealth. In 1527 Alonso de Grado died of “a natural death”, and Doña Isabel became a widow, probably for the fourth time (López de Meneses A, 1948:475). She returned or rather was returned under the roof of Cortés, who by then was also a widower (Martínez J. L, ed. 1990:1:44). Again we’ll never know whether Doña Isabel was forced to become the new mistress of the Conquistador or was seduced. The end result was the birth of Doña Isabel’s first child, a daughter, baptized as Doña Leonor Cortés de Moctezuma. As soon as Cortés heard that his mistress was pregnant, he hurried to find her a new husband to prevent any ensuing scandal. His choice fell on Pedro Gallego de Andrade, a native of Burguillos del Cerro del Duque de Bejar, a small town in Extremadura. 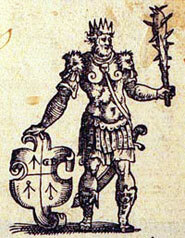 Pedro Gallego had participated in the conquest of Panuco, Colima and Michoacán, but didn’t distinguish himself by any particular deeds on the battlefield. Curiously he received for his service in perpetual encomienda the town of Itzquintlapilco in the present state of Hidalgo, later claimed by Doña Isabel as the private estate of her father (López de Meneses A, 1948:477). Contemporaries described Pedro Gallego as a high-spirited, agreeable and easy-going person. These qualities completely suited Cortés’s purposes. So, approximately in 1528, the cheerful son of Galicia and Motecuhzoma’s daughter, who was already in her third or fourth month of pregnancy, were solemnly married in church. According to Bernardino Vázquez de Tapia she gave birth to Leonor five or six months after the wedding (Martínez J. L, ed. 1990:1:44). To the Mexica “princess”, educated in a severely restrictive atmosphere, the whole experience must have been a terrible shock, which she evidently tried to forget. The baby girl was immediately transferred to the house of licentiate Juan Altamirano, a distant relative of Cortés and his most trustful assistant in all affairs, both legal and illegal. Doña Isabel didn’t mention her illegitimate daughter in her will, although she named Juan Altimirano as one of its executors. Subsequently Doña Leonor Cortés Moctezuma married Juan de Tolosa, the founder of silver mines in Guanajuato. From this family came Juan de Oñate the Minor, the great-great-grandson of Doña Isabel, who started the conquest of New Mexico. We don’t know much about the life of Doña Isabel after her “emergency” marriage. It looks as if she was generally recognized as the “main and principal heir” of Motecuhzoma, and had certain influence even in Spanish circles. Her difficult and even painful experience nevertheless taught her to adapt successfully to new realities and to deal with quite different categories of people from Indian nobles and commoners to Catholic missionaries, and Spanish functionaries. Thanks to Cortés’s donation she owned the encomienda of Tlacopan, which was listed among the ten most profitable land holdings in the entire Basin of Mexico. When around 1529 she bore a son to Pedro Gallego, the child, named Don Juan de Andrade Moctezuma, was baptized by Bishop Juan de Zumárraga, the highest member of the Catholic Church in Mexico. However, Doña Isabel’s position as the principal and legitimate heiress of Moteuczoma Xocoyotzin, and her rights to the estate granted by Cortés were constantly challenged. Some Conquistadors like Ruy Gomez, in trying to justify their deeds, affirmed that Moteuczoma was not a “legitimate lord” but rather a usurper and tyrant (Epistolario de Nueva España 1940:7:33). Doña Isabel’s half-siblings, Doña Leonor de Moctezuma and Don Pedro de Moctezuma Tlacahuepantli questioned the mere “legitimacy” of her birth. Tlacopan native leaders and colonial authorities concerned with the needs of growing Mexico City actively campaigned to dispossess Doña Isabel of the properties she had been granted. Around 1530 she was actually deprived of Tlacopan and a large orchard, due to the maneuverings of Alonso de Estrada the Lieutenant-Governor of New Spain, and a passionate enemy of Cortés. Fortunately for Motecuhzoma’s daughter, at least Tlacopan was returned to her in the same year, thanks to the order of her namesake Queen and Empress Isabel of Portugal, the wife of Charles V (AGI, Justicia 181:1:f.26v). As for Pedro Gallego, in full accordance with the Castilian laws of that time he used his wife’s fortune as his own, and spent it largely on seeing through his law suit, giving formidable bribes to judges and the colonial authorities. Spanish neighbours of Doña Isabel including Cortés himself also caused her many troubles. Their livestock damaged her crops, whilst their water-mills consumed all the water needed for the irrigation of her fields (AGI, Mexico, 1088:3:39v). When Pedro Gallego suddenly died on April 15, 1531, Doña Isabel found herself in a difficult situation. A widow with a small son of hardly three years old, she had no property she could sell and no money - probably the result of several years of dispossession, economic hardship and vast expenses, incurred by her deceased husband. Moreover, in the highly competitive environment of the early colonial period Doña Isabel’s legal position was doubly disadvantageous, for she was both Indian and a woman, albeit of “royal blood” and a “very good Christian”. Indian women of whatever social status were regarded by Spanish law as minors, barred from enjoying civil rights due to their “intellectual inferiority”. Considering as well that Spanish justice was based on examining written records Doña Isabel’s illiteracy made her dependent on help from a qualified lawyer or at least a person capable of correctly drafting petitions. Not surprisingly she chose the only option open to her - to marry someone able and qualified enough to represent and protect her interests before the colonial and Spanish authorities. It seems that this time Doña Isabel made her own choice, for her new husband Juan Cano de Saavedra, an hidalgo (member of the lower nobility) from the city of Cáceres in Extremadura was no friend of Cortés. She married him in the same year 1531, after apparently a very short period of mourning for Pedro Gallego. The couple sired five children: Don Pedro Cano de Moctezuma, Don Gonzalo Cano de Moctezuma, Don Juan Cano de Moctezuma, Doña Isabel de Moctezuma (the Minor), and Doña Catalina de Moctezuma. In Spain the Cano family occupied a relatively high position. Pedro Cano (Juan’s father) was alcalde (commandant) of the fortress of Cáceres, and his uncle Diego Cano was escribano (notary) to the Crown Prince Don Juan, son of King Ferdinand of Aragón and Queen Isabel the Catholic of Castille (López de Meneses A, 1948:480). Juan Cano first came to Mexico with the expedition led by Pánfilo de Narváez as a young man of 17-20 in April 1520. Consequently he ended up in a fight with Cortés, and probably as a result was cold-shouldered by the future Marqués del Valle (Oviedo 1995:118, 124-125). This didn’t prevent Juan Cano from serving Cortés during the siege of Tenochtitlan in 1521, and later he played an active part in the conquest of Oaxaca, Michoacán and of the Huastec region. For these merits he received in encomienda the town of Macuilxochilco and a plot of land in Mexico City (López de Meneses A, 1948:480). At the time of his marriage with Doña Isabel Juan Cano was still a bachelor of 30-31 years. He must have displayed both energy and ambition, and his marriage with Doña Isabel was apparently based on mutual interest. By marrying the daughter of the last Mexica overlord Juan Cano’s position and status rose high enough for the couple to proceed to claim the entire heritage of Motecuhzoma. Unlike his predecessors Juan Cano found himself in possession of the vast landholdings of his wife including Tlacopan, to which he added his own livestock and money. As for Doña Isabel she had found at last a manager for her estates, and someone intelligent, literate, active, and determined, to represent her interests. What’s more, it seems that Juan Cano might have had some connections at the Spanish Royal Court (Oviedo 1995:118). It should be noted as well that according to Castilian laws of the time - also valid in Spanish colonies - a married woman was not allowed to enter the court on her own account. However, she could act through her husband or any other adult male relatives. That’s why where these documents relate to Doña Isabel’s inheritance rights we find her husband as the main actor. The main concern of Doña Isabel and Juan Cano was the restitution of all the lands, settlements and objects of value, once owned by Motecuhzoma Xocoyotzin. They also struggled successfully against any further attempts to strip them of even one settlement, given to Doña Isabel in dowry by Cortés. In almost 20 years from 1531 to 1550 Juan Cano and his wife were involved in 3 lawsuits all based on territorial claims, and won two of them (López de Meneses A, 1948:484). 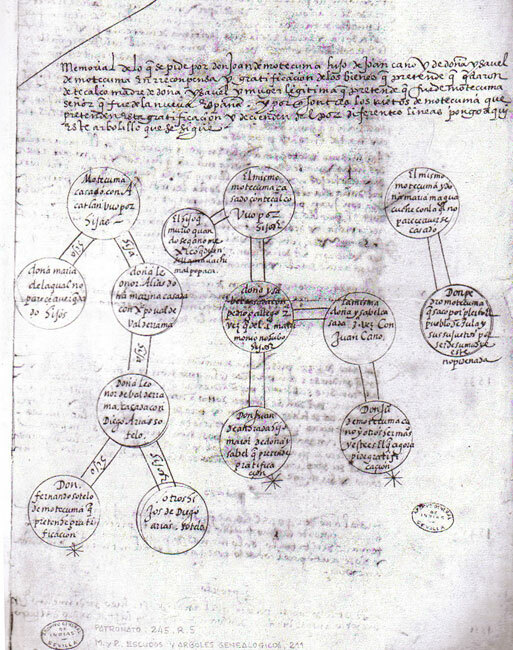 As for the campaign for Motecuhzoma’s inheritance, already by April 1532 Juan Cano had commissioned from anonymous Franciscan monks two documents, focusing on the genealogy of the Mexica lords, their legal position as “natural lords” of Mexico, and their private land holdings. These documents were already mentioned above: the Relation Concerning the Genealogy and Lineage of the Lords, who have governed this Land of New Spain, and the Origin of the Mexicans. Both documents stressed that because Motecuhzoma had voluntarily accepted the sovereignty of the Spanish king, there were no reasons to deprive his daughter, the “only legitimate heiress”, exemplary Christian and loyal friend of Spaniards of her ancestral possessions (García Icazbalceta 1941:245, 51, 256, 270-273, 275-276). However, neither of these documents brought any results. 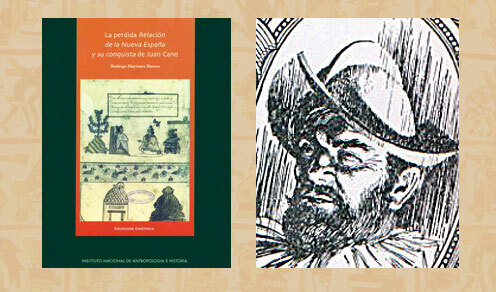 It seems that Juan Cano’s voyage to Spain in 1542-1544 was also fruitless, although Juan Cano used every opportunity to speak about the inheritance rights of his wife, as he did for example during his stop in Santo Domingo in September of that year. Tengo entendido que Petronila Sotelo de Moctezuma fue hija de Leonor Valderrama de Moctezuma, nieta de Moctezuma Xocoyotzin, ¿sabeb algo al respecto? Gracias. Well,it turns out,the drawing is a pencil drawing of my great-great grandfather who was the last of the heirs to fight for the properties of Moctezuma, mentioned in a pamphlet by someone who traced back the geneology. This drawing was done while he was in jail. He was let go from the jail because he was terminally ill and was sent to die at his home. The only thing which strikes me as suspicious is how soldiers were sent to guard his home until his death in case he had any ideas for a conspiracy against the Mexican government. My grandmother (his grand-daughter) mentioned being related to a Barragan family, which from my understanding, have a direct lineage to Isabel Moctezuma. I’m still collecting data from my mother and searching more about my lineage online. 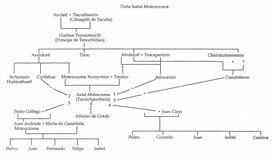 Yes, there is a geneological tree made by someone who traced it back to Isabel Moctezuma in 1947 and has my great-great grandfather’s name mentioned. I’m curious to find out why soldiers were guarding his home to make sure he died without saying a word. I wonder what he knew. His name was Asuncion Rodriguez. I would love to have more information of the lineage of Isabel Moctezuma. I think I may be from that direct lineage and I’m totally serious about this. I have inherited a pencil drawing of my great-great grandfather who was fighting over the properties of Moctezuma in the mid-1800’s. The drawing was done from jail and it was a story that was always told in my family because we were from the direct lineage of the first wife of Moctezuma. This happened in Alaquines, Mexico and this is the entry way to the huastec region which once belonged to Isabel Moctezuma. I just want to find out if I am also a direct descendant of Juan Cano. Could you please send me more information? I could recommend her to contact Alejandro Moctezuma Arvizu, who has a spectacular archive of his family. He is in Faceboook and once he left comment about my article. 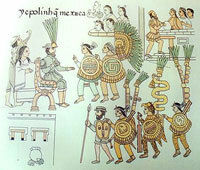 However, the account of descendance from the first wife of Motecuhzoma II Xocoyotzin is highly problematic. Motecuhzoma like other Nahua rulers had many spouses and concubines: 600 according to the anonymous Spanish commentor of the Codex Tudela and 3000 (sic!) according to Francisco Lopez de Gomara, the author who had evident vice of exaggeration. The question is who was the chief wife among them? Here sources give us contradictory evidence about who was Motecuhzoma’s first spouse. 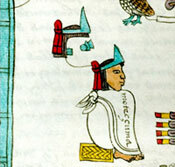 Ixtlilxochitl in his seventeenth century “Historia Chichimeca” states that the chief wife of Motecuhzoma Xocoyotzin was certainly Tayhualcan, daughter of Tlacopan ruler Totoquihuatzin. Alvarado Tezozomoc mentions as Motecuhzoma’s principal consort the daughter of his predecessor Ahuitzotl without giving her name. 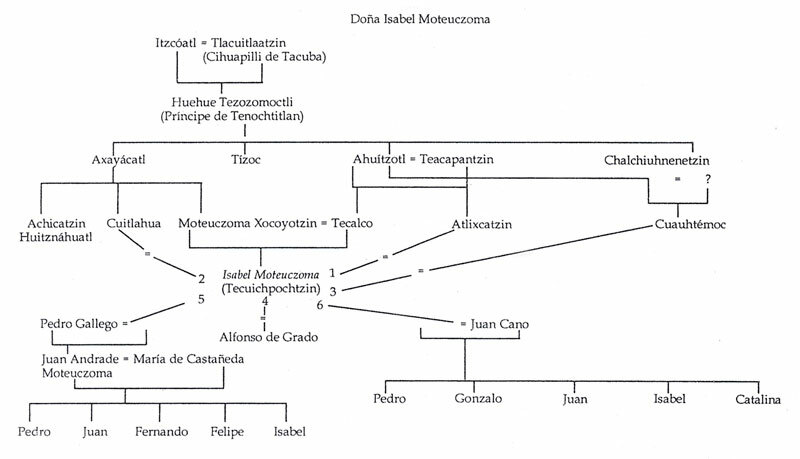 In the “Informacion de Doña Isabel de Moctezuma” the name of Ahuitzotl’s daughter referred to constantly as the principal spouse of Motecuhzoma is transcribed as Tecalco. 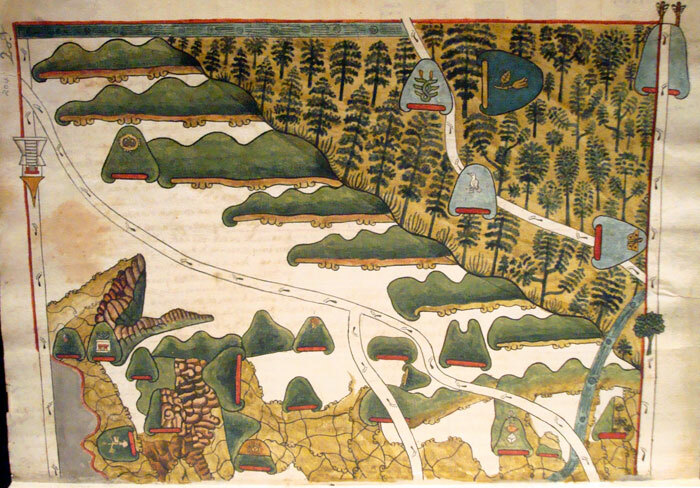 Taking into account the enormous number of mistakes in transcriptions of Nahua personal names and place names this evidence is somewhat dubious. 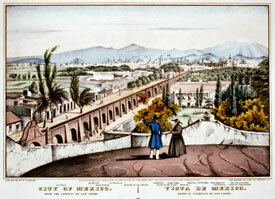 Prescott in his “Conquest of Mexico” states that Motecuhzoma had two principal wives Tecalco and Acatlan. 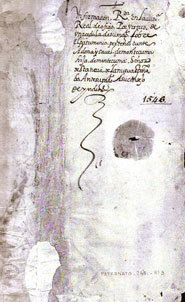 Possibly he simply combined Bernal Diaz’s statement “tenia dos grandes cacicas por sus legitimas mujeres” with documents from the Archivo General de las Indias, for example with the letter of Diego Arias de Sotelo to the king Phillip II dated to April 30, 1562. To my knowledge In the latter source the name Acatlan appears first. However, every descendant of Motecuhzoma claimed that only his great-grandmother was the legitimate wife of the Mexica “emperor” for obvious reasons - to get rights for his supposed inheritance. Unfortunately the Mexica didn’t have the concept of legitimate and illegitimate wives before the Conquest. All the spouses and concubines were legitimate in their own right, but one of them usually occupied the principal position. The same poligynic practice was widespread among other Mesoamerican peoples. Spaniards took it as proof of Indian lust and tried to impose their own juridical concept. At the same time “Informacion de Doña Isabel de Moctezuma” and the so-called Cano’s Relaciones state that Motecuhzoma and his chief wife had only two children, Axayaca who was killed in tender age and Tecuichpochtzin, later Doña Isabel. She had no issue from her three Mexica husbands but seven children from her two Spanish husbands (Pedro Gallego and Juan Cano) and Hernando Cortes. She was for brief time his concubine in 1526-27 and bore him a daugther baptized Leonor. Leonor married Juan de Tolosa of Biskaya and established a dynasty of silver mine owners in Zacatecas. Juan de Andrade, Isabel’s son from her marriage with Pedro Gallego went to Spain and married Elvira de Toledo. They also had children and established the line of Andrade Moctezuma. Finally with Cano Doña Isabel had three sons, Pedro, Gonzalo y Juan and two daughters Isabel and Catalina who became nuns. So, Aurora has a difficult task to trace from whom of Isabel’s children she could descend. I remind you five left their own posterity. What kind of drawing does she have? A geneological tree? Los invito a visitar estos link sobre la descendencia de alguna de las familias que se encuentran en México. Good read. Learned a lot of things I didn’t know. Plus it shows that she married more Spanish husbands. I’m glad to see an article that uses the word Mexica. Also, talking about Cuauhtemoc’s death, there’s a lot of sources out there that many people say whether Cuauhtemoc did try to have a conspiracy against the Spaniards. You can make an entire article on that. A side note, a good movie to see about Tecuichpo (which is fiction of course) is The Other Conquest/La Otra Conquista. Mexicolore replies: In reply to Tecpaocelotl’s measured feedback - always welcome - and to other comments we received that were positively vitriolic (and which we removed) Anastasia has kindly written a Postscript, which you can see at the end of Part 2 - just follow the link above.